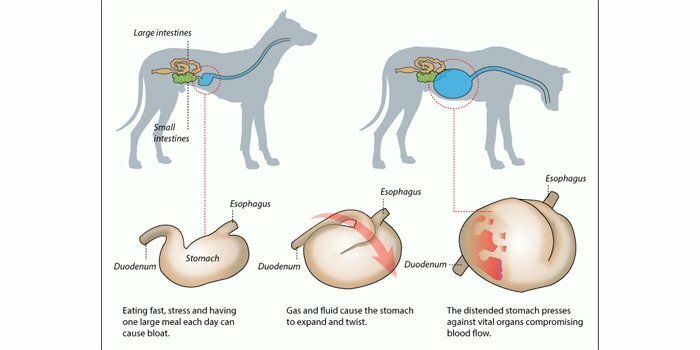 Gastric dilatation and volvulus (GDV) is an acute life-threatening disorder in dogs. It is considered a medical/surgical emergency. The earlier this disorder is recognized and treated, the better the chance of survival. Gastric dilatation begins with distention of the stomach primarily with air, but the distention may be due to food or water as well. After the stomach dilates like a balloon, it may or may not twist on itself. If the stomach twists, this is called volvulus. At this point the stomach is twisted off from the food pipe and the rest of the intestines. Nothing can enter or leave the stomach. Because of the gastric juices in the stomach, the stomach contents start to ferment and produce increasing amounts of trapped gas. Clinical signs of GDV are classic. The dog will stand with his front and back legs at a triangle to the body. The eyes will become glazed over. The dog will try to vomit and may bring up some foam or belch at the onset of bloat. He will try to have a bowel movement and empty his bowels until nothing but diarrhea comes out. He is trying to relieve the pressure in the stomach, but because the stomach is twisted he cannot remove the pressure. The dog will become increasingly restless and start salivating and panting because of the pressure on the diaphragm and the pain associated with GDV. On physical exam the dog will have an increased heart rate with a weak and thready (scarcely perceptible) pulse. The gum color will be pale to purple. The stomach does not always LOOK distended, but if “pinged” with a finger, it will sound like a steel drum. Veterinary intervention is imperative at this point. Medical intervention requires treatment for shock, including intravenous fluids, blood tests, electrocardiograms, x-rays, and drug therapy directed at the changes that have occurred. If possible, the veterinarian will try to decompress the stomach with a bloat tube passed into the stomach. If this is not possible, surgery is required to treat GDV. Surgery includes replacing the stomach and possibly the spleen if it has rotated with the stomach when it twisted. The spleen and part of the stomach may have to be removed due to prolonged lack of blood flow to both organs and organ death. A Gastropexy (a surgical procedure where the stomach is tacked to the abdominal wall) is done to prevent future stomach twists. Even with medical and surgical intervention the dog may not survive due to the affects of GDV on the entire body. Heart failure up to 72 hours post treatment may occur.